The New Front Line in Melanoma: Immunotherapy OR Targeted Agents? In clinical trials, melanoma remains a ripe discovery ground for the application and combination of immunotherapies and targeted drugs. After Laura Kent learned that a mole on the back of her left arm was cancerous in May 2014, she endured three surgeries to remove it, along with several nearby lymph nodes. Through all of that, the cancer kept coming back. Kent’s tumor tested positive for one of the BRAF mutations that is now treatable with targeted anti-cancer drugs, but her doctors at Fox Chase Cancer Center in Philadelphia thought she might do even better on a treatment that would prompt her own immune system to eliminate the cancer. So, under the care of medical oncologist Anthony Olszanski, in January 2015, Kent was entered into a trial of two immunotherapy treatments: Imlygic (talimogene laherparepvec), a genetically modified form of the herpes virus, and Keytruda (pembrolizumab), which targets the immune-suppressing protein PD-1. The Imlygic was injected directly into her melanoma lesion, and then, a few hours later, she received an infusion of Keytruda. After three doses of the combination treatment, which Kent received every other week, her melanoma disappeared. “That was when I knew I would not die from this cancer,” says Kent, 39, who lives in Harrisburg, Pennsylvania. Kent expected to keep taking Keytruda for a full year, but the drug caused her to develop joint pain, a possible consequence of this and other treatments that alter the immune system. But her oncologists couldn’t find any sign of her cancer anyway, so they took her off all treatments. Six months later, she is still cancer-free — and grateful she was able to get there without chemotherapy. Melanoma remains a fertile territory for the development of new, highly effective therapies — particularly drugs that stimulate the immune system to fight off the cancer. Imlygic, for instance, was approved by the U.S. Food and Drug Administration in October of 2015, and Keytruda was approved in September 2014 as a second-line drug and then in December 2015 for first-line use. At the same time, researchers are discovering new mutations in melanoma and developing drugs to target them. Targeted treatments that have already been approved have improved the prognosis for patients who test positive for the BRAF mutations known as V600E and V600K, so now research teams all over the country have launched hundreds of clinical trials, testing not only new targeted treatments but cocktails of these drugs in combination with immunotherapies that might someday reverse the poor outcome for patients who would have run out of options just a few years ago. The Imlygic/Keytruda combination trial is generating excitement among oncologists because of the potential of these drugs, each approved as a single agent, to work together to capitalize on two different methods for activating the immune system. Imlygic is what’s known as an oncolytic virus: It has a natural ability to kill cancer cells, but it is also specially engineered to include a protein called granulocyte macrophage colony-stimulating factor (GM-CSF), which attracts immuneboosting cells to the tumor. Keytruda works differently, because it inhibits the PD-1 “checkpoint” that can be activated in some cancers, preventing the immune system from recognizing and attacking cancer cells. With Imlygic, “the immune system may recognize the melanoma better, and then when [Keytruda] is given, it enhances the immune system’s effect,” Olszanski says. In an early trial including 16 patients with advanced, previously untreated melanoma, which released data in November 2015, 56 percent of participants responded, including two who experienced complete remissions. That bested the performance seen with either agent alone. And based on those results, the trial moved into phase 3 at more than 20 cancer centers, and continues to recruit patients. Scientists continue to uncover new immune checkpoints that govern the development and growth of melanoma. One emerging target is indoleamine 2,3-dioxygenase (IDO1), an enzyme that allows tumors to stay under the radar of the immune system. Several drugs are being developed to inhibit IDO — an approach that may be even more promising in combination with other immunotherapies. For example, an IDO1 inhibitor from Incyte called epacadostat is set to enter a phase 3 trial in combination with Keytruda in 2016; the trial (NCT02752074) is not yet recruiting. 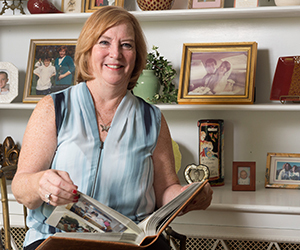 Susan Giorango had a melanoma on her cheek that had spread to her lungs and adrenal glands when she was accepted into an early trial of the epacadostat/Keytruda combination in 2014. 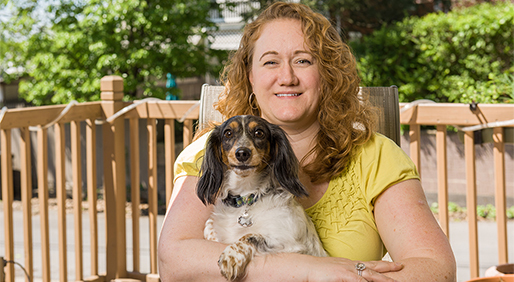 An initial regimen of Yervoy had helped to shrink the tumors, but it wasn’t until she started the experimental combination that Giorango’s doctors told her they believed all of her metastases were gone. During the trial, Giorango took two pills twice a day for a year. She remains on the regimen and returns to the University of Chicago every three months for blood tests and imaging scans. She doesn’t recall ever feeling sick from taking any of the treatments, she says, aside from developing a minor rash that could be easily controlled with a cream. Another experimental therapy is derived from patients’ own tumor cells. Called LN-144, it is now entering a phase 2 trial that is still recruiting (NCT02360579). LN-144 is based on a technology called “adoptive cell therapy,” which was developed at the National Cancer Institute. The therapy combines tumor infiltrating lymphocytes — white blood cells that occur naturally inside tumors and work to kill cancer — with interleukin-2 (IL-2), an immuneboosting drug. In data presented last September from a trial of 101 patients with advanced metastatic melanoma, 54 percent of participants responded positively to the treatment, including 24 who had complete remissions. Of those, all but one remained disease-free for between 30 and 47 months. “That’s promising, and I think we’ll see a lot of activity on this front in the next two or three years,” says Jeffrey Weber, deputy director of the Laura and Isaac Perlmutter Cancer Center at New York University and co-director of its melanoma program. Weber serves on the scientific advisory board for Lion Biotechnologies, which is developing the treatment. The first immune checkpoints that were discovered and targeted, PD-1 and CTLA-4, remain of interest to researchers, particularly in what’s called the “adjuvant” setting, where patients have been successfully treated with surgery and the main goal is to prevent a recurrence. One such trial is comparing Yervoy to Keytruda in patients who had advanced melanoma lesions that were removed. Yervoy has already been shown to help prevent recurrence. A study published last year in patients who had undergone surgery reported that median survival without recurrence was 26 months in patients on Yervoy, versus 17 months for those taking a placebo. Overall, the drug reduced the risk of recurrence by 25 percent. Based on those results, in October 2015, the U.S. Food & Drug Administration approved the use of Yervoy at a dose of 10 mg/kg for patients with stage 3 melanoma who have undergone surgery to remove the cancer and nearby lymph nodes and have been rendered free of disease. Fatigue, nausea, itching, diarrhea and rash are some of the most common side effects of both Yervoy and Keytruda. Also common with Keytruda are cough, decreased appetite, constipation and joint pain. Even though immunotherapy has moved to the forefront of melanoma care, researchers are still discovering mutations and coming up with new ways to shrink tumors by exploiting them. For example, several drugs are being investigated that target mutations in a gene called NRAS. These include drugs that inhibit MEK (mitogen-activated protein kinase), an enzyme that becomes overactive and that promotes cell growth and survival. One such treatment, binimetinib, has been turning in impressive results in a phase 3 trial. In December 2015, researchers reported that the drug nearly doubled progression-free survival to 2.8 months in patients with advanced NRAS-mutated melanoma when compared to the chemotherapy drug dacarbazine. Inhibiting MEK might also be effective in patients with a mutation called NF1. Side effects could include rash, swelling and, in rare cases, injury or stress to muscle or the heart or brain; an elevated level of myelocytes in the blood; or eye changes. The standard of care for patients with BRAF-positive melanoma is to combine a BRAF inhibitor with a MEK inhibitor, such as the already approved Mekinist (trametinib), which is given with Tafinlar (dabrafenib), Luke says. But other subgroups of patients might benefit from different combinations, including patients with NRAS mutations. For example, CDK4 is another target in NRAS-mutant melanomas that may be important. Early trials combining MEK inhibitors with CDK4 inhibitors have been promising. “It improved the response rate from about 20 percent to between 35 percent and 50 percent,” Luke says. That said, the side effects can be severe, ranging from abdominal pain to fatigue, raising questions about whether using such combinations will be practical in the clinic. Another subset of the disease called uveal melanoma, which occurs in the eyes, may benefit from inhibition of MEK. A mid-stage trial is underway investigating Mekinist in patients with this type of melanoma that is metastatic, both as a solo therapy and in combination with an experimental compound that inhibits a protein called Akt. Inhibiting c-MET, another enzyme that promotes cell growth and metastasis, may also prove useful in this patient population. A phase 2 trial of Xalkori (crizotinib), a c-MET inhibitor, in patients with uveal melanoma who face a high risk of recurrence (NCT02223819) is now recruiting. And early data suggests that yet another mutation, called c-KIT, may be important in melanoma, including the uveal form. Several drugs are already approved to target this mutation, including Gleevec (imatinib) and Sutent (sunitinib), and several trials are underway in uveal melanoma. The most common side effects of Xalkori include upper respiratory infection, nausea, dizziness, diarrhea, fatigue and rash. Sutent can also cause fatigue, diarrhea and nausea, as well as heartburn, changes to taste and hypertension. Many oncologists who treat melanoma believe the future is pointing to combinations of three different drugs. While mutation-targeted therapies can work quickly and in a higher percentage of patients, immune therapies tend to give longer responses. So combining the two types of therapies, along with developing better tests to match the right tumor to the right drug or combinations, remains a high priority. For example, one ongoing phase 1 study combines the BRAF inhibitor Zelboraf (vemurafenib), the MEK inhibitor Cotellic (cobimetinib) and the experimental immunotherapy atezolizumab, which is in the class of drugs called PD-L1 inhibitors; the trial, NCT01656642, is recruiting. A combination of Zelboraf and Cotellic was approved by the FDA based on a phase 3 trial that produced an overall response rate of 69.6 percent versus 50 percent for Zelboraf alone. Investigators involved in the triple-therapy study hope the addition of atezolizumab will boost the response rate even more without adding to the toxicities. Another triple combination generating excitement in the melanoma community is a study of Keytruda with the BRAF inhibitor Taflinar (dabrafenib) and the MEK inhibitor Mekinist.